Pamplin Media Group - What's going on at Willamette Falls in Oregon City? 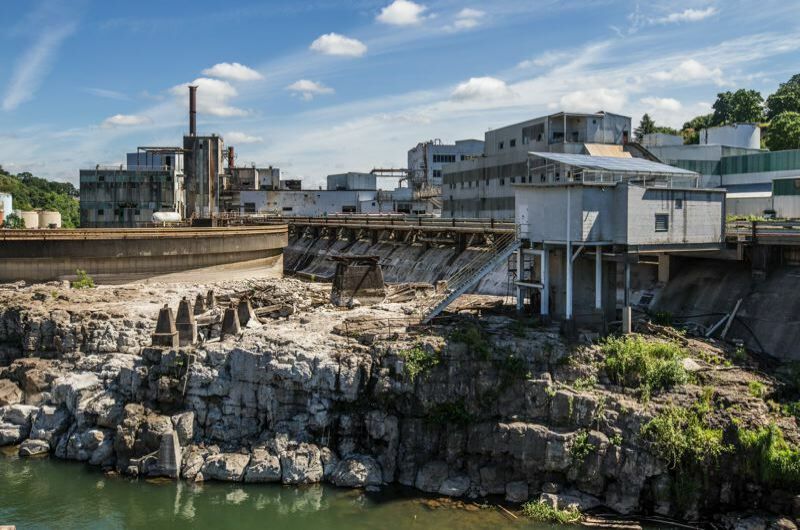 Two of the questions people most frequently ask about Oregon City are "When are they going to build something at that shuttered paper mill?" and "What's going to happen to all of those old buildings there?" Metro officials have come closer to providing answers with a recent web post titled "What's going on with that project, anyway?" They say that the effort to provide public access to Willamette Falls is scheduled for groundbreaking in April 2020 to coincide with the period during the spring when in-water work is allowed. Once started, the walkway's construction will take four years to complete, officials estimate. After a year's delay stemming from issues with the property owner (see news coverage in "Developer pays tax, utility bills at Willamatte Falls"), Metro and the other public partners on a public walkway to the falls in May 2018 submitted a permit application to the U.S. Army Corps of Engineers to proceed with construction of Phase 1 of the riverwalk. The joint permit application to the Corps kicked off a Section 106 process, required by the National Historic Preservation Act to consider the effects of certain projects on historic properties and culturally significant sites. Federal officials say that Metro's application to the Corps is still "incomplete." But officials at the regional governmental agency are not alarmed by the "technical incompleteness" of their application, which they say won't cause any further delays in the project. "It's a long permitting process where we're going to have a series of comments and back and forth with the Army Corps," said Brian Moore, Metro's riverwalk project manager. Until that application is complete, there's been a lot of behind-the-scenes work and no further requests for public input. Jeffrey Henon, a spokesman for the U.S. Army Corps' local division, said citizens will have the opportunity to weigh in on the Corps' evaluation of the riverwalk proposal. "We can already see that there are some things they're going to have to address," Henon said. "We will be asking the public for their input once we have a fully formed application and proposal." Oregon City, Clackamas County, Metro and the state are the four public partners on the riverwalk project. A federal permitting process was triggered for the public project, in part, because of the potential for archaeological work at the site that has been sacred to Native tribes for millennia. "I wouldn't take the technical incompleteness as a deficiency so much as that there are a lot of moving pieces," said Christine Lewis, the recently elected Metro councilor representing West Linn and Oregon City. Metro officials said their Corps application has been intentionally left incomplete so the tribes can continue to provide sensitive cultural information. "We had a tribal advisory board, where we met with various reps for those tribes and worked hard to get input from them on the project," Moore said. "They wanted to continue the conversation once we had submitted the application to the Corps of Engineers." The exact nature of the archaeological work at issue is a matter of necessary secrecy, given that the tribes' comments contain culturally sensitive information, said Sara Thompson, spokesperson for the Columbia River Inter-Tribal Fish Commission, a technical and coordinating agency for the Yakama, Nez Perce, Warm Springs and Umatilla tribes. As this newspaper previously has reported, Willamette Falls is the only place the tribes can continue their traditions of harvesting lamprey for sustenance, although they're restoring lamprey habitat in the Umatilla River. Thompson provided the following written comment on the status of the tribal conversations with Metro officials regarding the riverwalk application to the Corps: "As the ancestral homelands to the Grand Ronde Tribe, Willamette Falls is a sacred place. Metro is a valued partner to the tribe, and we look forward to working with them on this project and many others." As part of the planned riverwalk construction, Metro proposes to remove buildings that are potentially eligible for the National Register of Historic Places. This planned demolition, including construction work in and over the river, is another reason Metro's riverwalk plans triggered a federal review. "The broad approach for the permit presumed potential demolition for most of the buildings on the site," Moore said. "There is almost nothing that you can do on this site that doesn't impact some building that is potentially eligible for the National Register of Historic Places." Federal law requires agencies to undertake some sort of "alternatives analysis" before approving permits. In the case of demolishing potentially historically significant structures, Metro probably will have to submit various alternatives that might avoid razing the structures. In order to obtain federal permission to demolish the structure, Metro might have to explain why other priorities are more important than retaining historic resources. For example, Metro sketched out a plan for retaining the Mill G Recovery Boiler, which currently is scheduled for complete demolition. In a striking graphic, an architectural rendering shows people walking to the falls with a big steel skeleton in the immediate background. Moore said that Metro officials, in coordination with the other public partners and thousands of citizens who have provided input, have concluded that the restoration of the historic shoreline and significant habitat improvement is more important than retaining a cool-looking piece of industrial equipment with some historical value. 'The recovery boiler is within the footprint of that restored alcove," Moore said. It remains to be seen whether federal officials will agree with Metro's conclusions on the recovery boiler and various other considerations. U.S. Army Corps officials have the power to send Metro's application back to the drawing board by insisting that other priorities be reconsidered. Army Corps officials said that Section 106 of the National Historic Preservation Act requires the Corps to evaluate how the project avoids and minimizes the effects on historic properties, but that legislation does not require historic properties be preserved. "The Corps may identify alternative ways to redesign the project that avoids or minimizes the effects to historic properties," Henon said. "If the project's plans to mitigate the adverse effects to historic properties aren't adequate, we may withhold issuing the permit until they are adequate." Metro officials say they are prepared for potential monkey-wrenches from the federal review. "We're not done with the work to get this project done," Moore said. "We're responding to all of the comments that Army Corps issues to us when they issue them to us." One comment that the Corps could have for Metro is the riverwalk application's omission of a so-called Intensive Level Survey. According to the state's Historic Preservation Office, this type of survey can be necessary "to meet the needs of those completing the federal Section 106" process led by the Army Corps. Moore said that Metro's application is relying on Oregon City's decision during the land-use process to forgo an Intensive Level Survey. "If that's something that Army Corps is going to require of us, then we provide them with that," Moore said. Siobhan Taylor, executive director of the Willamette Falls Area Heritage Coalition, says her group has no objection to plans to demolish historic buildings at Willamette Falls, despite the group's goal to create an officially recognized National Heritage Area involving the industrial area on both sides of the falls. "We already have a state area established at the falls, and now we're working on getting a national area," Taylor said. "Our emphasis is telling the history and heritage of the entire region and what makes it unique and special. … Industrial heritage is a big component of it, but our job will be to help interpret the broader story along the riverwalk." 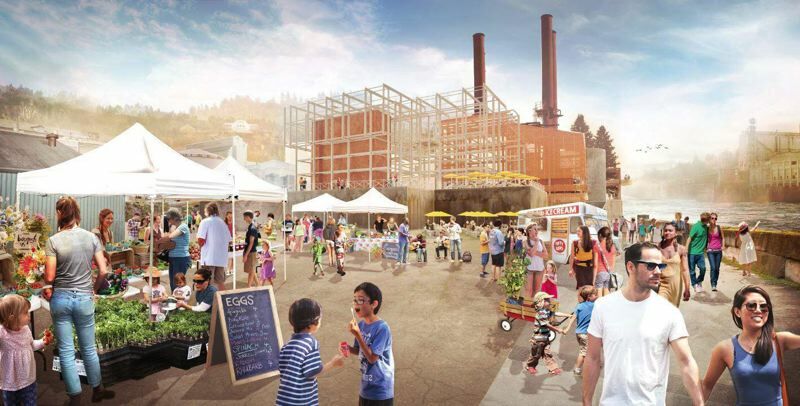 Metro officials have confidence that their application will be approved, given the the Oregon Historic Preservation Office was consulted during Oregon City's land-use process that identified five structures for reuse. Lewis was chair of the West Linn Historic Review Board through Dec. 31, when she took office as a Metro councilor. She sees potential for different levels of historic preservation, including saving a wall of a historic building that could add some interest to the riverwalk. "There's definitely the opportunity to identify something as a historic resource, but that doesn't mean that building won't be modernized and changed," she said. "As an organization, we're far from the point where we're going to have any expertise put forward in front of us for having historical preservation discussions." In planning for the riverwalk, Metro sketched a scenario that saved the oldest building that is still intact on the Willamette Falls site, but it is not on the list of structures proposed to be repurposed. A drawing showed where the 1903 Pullery could have been moved from its current footprint, which is in the way of the planned walkway. "The goal that we're trying to achieve is to provide an inviting space for the community, and a metal-sided building without windows doesn't provide an inviting space," Moore said. As for potentially putting windows back into the Pullery building, Metro officials are leaning away from the idea. "When historic buildings are continually modified in that manner, it reduces their historic value, at least how I understand it," Moore said. The Army Corps' spokesperson hinted that Metro may receive approval for destroying buildings that potentially are eligible for the National Register of Historic Places by nominating others for protection. "Adverse effects to a property may be mitigated in part by nomination of another property to the National Register," Henon said.